Convertible sofas are a great way to give your guests a comfortable place to sleep while they’re at your home and away from theirs. These fold-out couches are comfortable, and we’ve done our research to bring you a selection of furniture that is easy to assemble and to use! In our sofa bed buying guide, we aim to bring you only the best of the available products! Let’s get started with some stuff you should know. Material: Sofa beds can come in conceivably any material. Favorites on this list include polyester, leather, and memory foam. Linen is also very popular, as well as twill. Any fabric is fair game for covering a sofa bed! Color: Many of the sofa beds on our list come in multiple different colors, from neutrals like brown and grey to oranges and purples. Whatever your décor happens to be, there’s a couch on this list for you! Throw Pillows: It’s great when sofa beds come with their own throw pillows – they’re included in the price and also match the couch and maybe even the colors in your living room! Some sofas on this list do just that! Feet Materials: The materials of the feet on the sofa are super important, especially if you have hardwood or laminate floors. You want to make sure they won’t tear your floors up while also being sturdy enough to support the bed. Size: These are the dimensions of the sofa bed. This can help you choose where you’re going to put it. These dimensions reflect the size of the sofa bed when folded, not when the bed is out. Warranty: A warranty helps protect you and your purchase. Within this time period, the company will refund or replace the product if there are any manufacturing defects or problems during normal use. It’s an assurance of quality! That’s all you need to know, so now we can get to our convertible sofa bed reviews. We’ve taken only the best of the best from a selection of beds so that you don’t have to mess around with sofas that aren’t comfortable or don’t work properly. Check out our top pick and budget pick first to get an idea of what’s available, and take a look at the rest of the list to help find your perfect sofa bed! Our pick for the best convertible sofa is this one from Rivet. It’s a great company with excellent customer service, and that’s just the start! 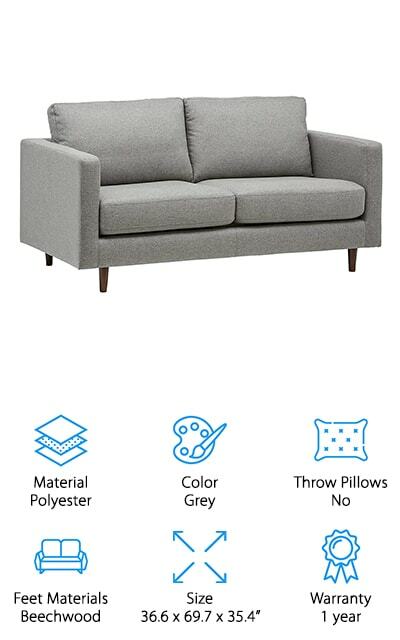 This sofa is covered with easy-to-clean polyester and comes in either medium gray or blue. The lines are sleek and modern, while still retaining a classic look and feel. 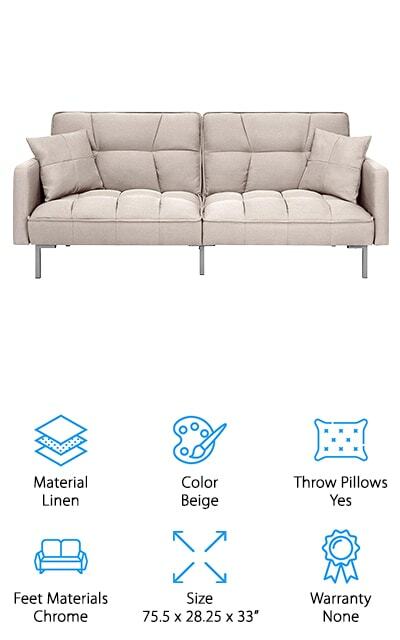 It’s the perfect sofa bed for the living room of your apartment! The fabric is durable and the wooden frame and legs are solid enough that you never have to be nervous. We love how simple it is to assemble and how comfortable the cushions are. 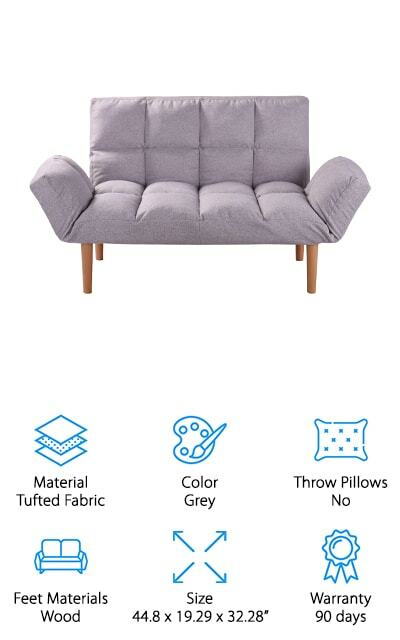 You won’t use any sleep while using this comfortable sofa. Plus, you can please your guests while still maintaining the design that you want. It’s convenient, stylish, and your guest will feel right at home! Plus, returns for the first 30 days after delivery are free, which is convenient if you find that you don’t like it. This Noyogratz sofa bed is a great convertible sofa sleeper for your office! It’s got a sleek, understated design that comes in a variety of colors to match your décor. These colors include dark grey, green, medium grey, mustard yellow, and pink as well as the blue! So no matter where you work if you have the room for it, you can use this sofa. It’s great if you have to work late and just need to take a quick break before getting back at it. The upholstery is linen, and easy to wipe clean when it gets dirty. The frame is sturdy and the legs feel solid enough to make you comfortable to sleep on it. We love how this sofa looks, and how it will fit in to really any setting, from your office to your home! It’s comfortable and effective at making your guests feel right at home when they aren’t at theirs. This convertible sofa from BCP is a great addition to any guest room or living room. It comes in a variety of colors. Instead of the standard beige here you can also get it in black, blue, brown, orange, red, light grey, and dark grey. The variety means that they’re sure to have an option to fit into your décor. It’s got a split-backed design so that you can lounge as well as sleep, and you can control each side separately depending on what you want. The futon-style frame is metal and easy to use; it’s not going to be a hassle to lay it out flat. The cushions are plush and comfortable, and it will stay that way no matter how often you use it. And it’s going to be hard not to with how comfortable it is! With a weight capacity of 550 pounds, you can share it with your friends – it’s the perfect sofa for movie night! 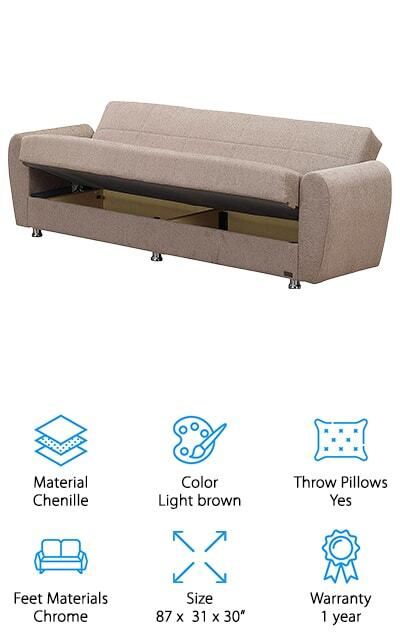 BEYAN makes this practical, modern sofa sleeper. You have to do almost nothing to fold it down due to the special interlocking pieces it uses. The feet are metal for aesthetic, and the frame is wooden, so it’s sturdy enough to last you a long time no matter how often you use it. It’s the perfect touch to any living room or bedroom, with clean lights and a pleasing design. The Chenille is easy to wipe down for spills, so you’ll have less staining potential if you have kids or clumsy friends. What we like most about this sofa, however, is the storage under the seats. This hidden storage compartment is a neat design that you can use to store anything out of the way and out of sight. This sleeper sofa is comfortable and functional, and with the added features you won’t want anything else! You can get it in dark brown as well! 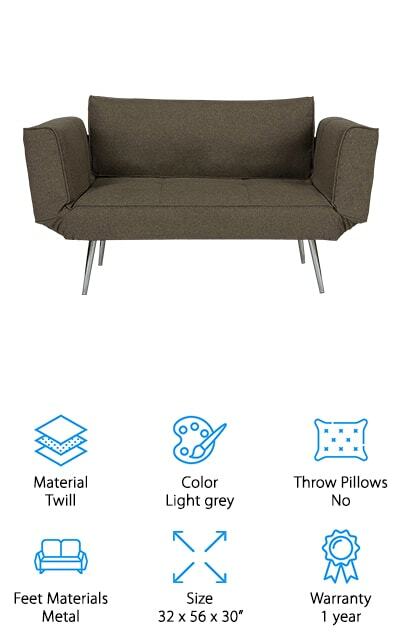 This great sofa for guests comes from Homegear. 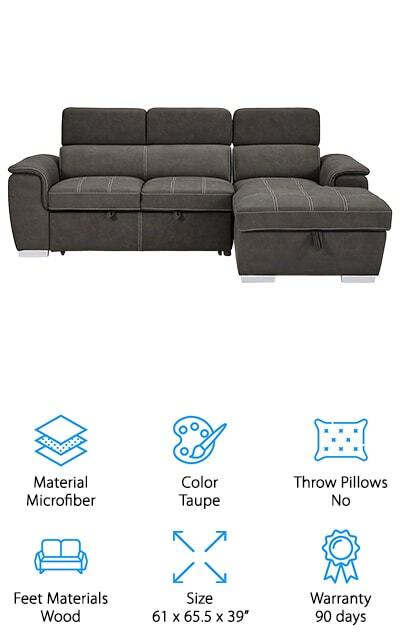 It’s got a sturdy wooden frame that will make it easy to move the parts around, which you’re going to want to do frequently: this sofa can become a bed or a recliner, so there are three different ways to enjoy it! 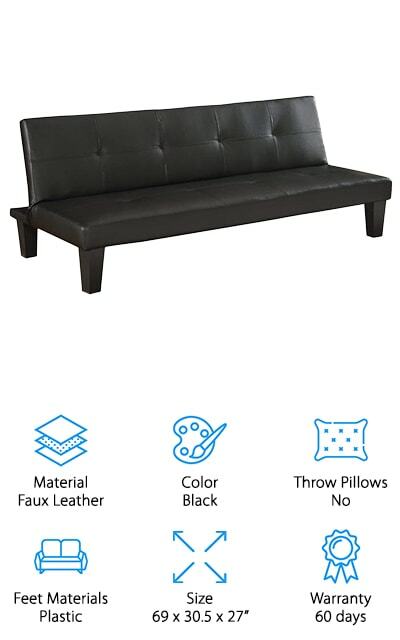 The cushions are upholstered with faux leather that’s easy to clean as well as cool and comfortable to sleep on. There is little to no assembly to start using this bed, and it can support up to 220 pounds. Keep this in mind while ordering, as it won’t be able to hold two adults. But if you’re ordering for kids, it’s the perfect sofa! It also comes in brown and cream to fit all of your simple, modern décor needs! The feet are plastic so they’ll be a bit easier on hardwood floors as well. 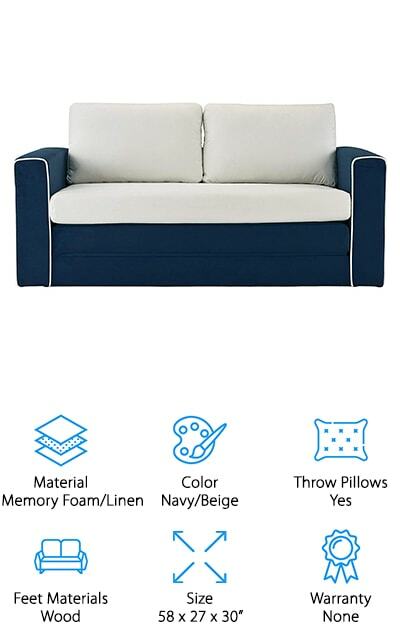 Don’t worry with this easy to use, simple sleeper sofa! If you’re looking for a comfortable sofa bed that’s the perfect size for children, look no further! This Divano Roma Sleeper folds out to just about four feet, making it the perfect sleeping center for sleepovers and siblings! The two-tone linen and memory foam make it simple and easy to match it with the décor in your living room or playroom. Besides the navy and beige combination, it also comes in black and light grey, blue and beige, dark blue and beige, grey and dark grey, and purple and beige. There’s something for everyone! It’s got a nice enough look that you can even set it up with your regular furniture and it will only add to your aesthetic! The frame is made of sturdy hardwood that is easy to convert and strong enough that you can rely on it. We love that this modern-looking sleeper sofa is actually the perfect size to accommodate your kids! QVB makes this convertible sofa, made of tufted fabric. It comes in grey, brown, and blue, and we’re sure you can find the perfect location in your home! It’s great for small spaces and will save you a lot of hassle with air mattresses or other sleeping arrangements when you have guests. It’s comfortable and the frame is made of a sturdy wood, so it’s definitely a solid piece. In fact, the legs are made of beech wood! There are side pockets on either armrest that you can use to store books, magazines, and even remotes! It can adjust in up to five different ways to help with lounging and sleeping, as well as being used as a normal sofa. This couch can do it all while fitting flawlessly into your modern home. We love the velvet tufted fabric that covers the cushions – it’s so comfortable! It can also be removed so you can wash it! Homelegance makes one of the best sofa beds on our list with this entry in the Ferriday collection. It comes in taupe and blue, so there’s something for just about every neutral décor style. The pull-out bed is a trundle that folds out to full size to help accommodate your guests. The microfiber cloth is soft and the cushions are comfortable to sleep on. The headrests can collapse, and under the pull-out bed is a ton of storage that you can use to keep things out of the way. How awesome is that? This space-saving guest pleaser is the ideal addition to your living room if you happen to have people sleep over fairly often. They’ll certainly enjoy their home away from home! It can accommodate weight up to 600 pounds altogether, so you can easily fit two adults on this sleeper sofa. The attached chaise is an amazing addition to an already perfect bed! 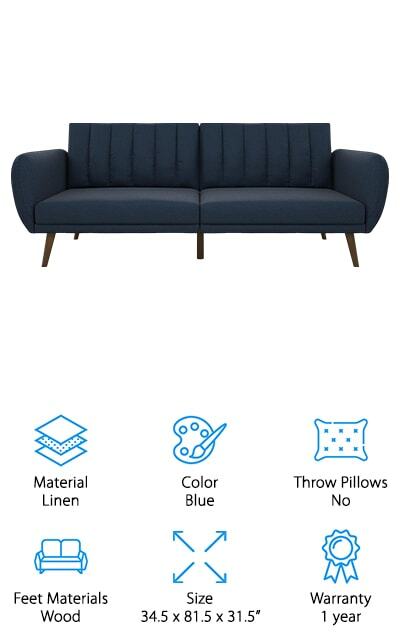 This modern sofa bed by DHP is unique on our list because it’s upholstered with twill, which is easy to clean and rich enough to be comfortable. It’s perfect for small spaces when you want to keep all of your lines clean and your look crisp. You can create either a sleeper or an L-shaped sofa in just seconds with the multi-function design, which allows you to use either shape effortlessly. It takes moments to assemble and includes as neat magazine pocket on the arm so you can store things. This particular sofa is navy blue, but it’s also available in a few different colors. Dark grey and tan are neutrals, but the color that sticks out here is the berry purple – we’ve rarely seen this color on couches and we love it. The cushion is made of foam and the frame is metal, so it’s sturdy and dependable. We love how easy the material is to clean! 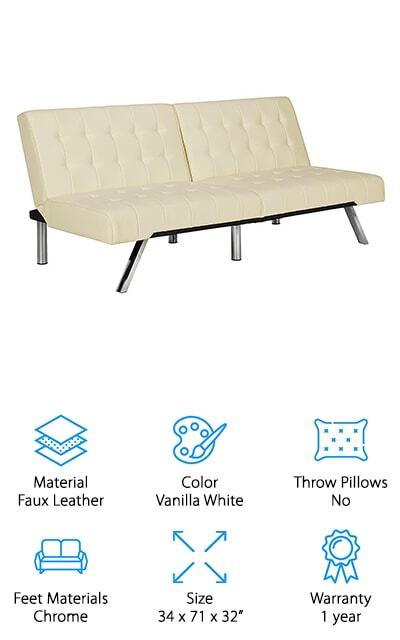 This white leather sofa bed from DHP will definitely add a modern touch to whatever room you choose to use it in. The back of the futon-framed sofa bed is split, so you can adjust the angle of each seat independently, including laying one down at a time. It’s so easy to convert this bed from a couch to a sleeping surface. It’s a sleek-designed sofa bed with a modern feel and chrome metal legs, so it’s definitely sturdy enough to be used every day. And when you use it every day, the cushions won’t get squishy or collapse on you like they might in other beds. We also love that the faux leather cushion covering is easy to clean and maintain. Comfortable and stylish, this can come in black as well for an even more modern touch. It makes out into a full bed, so you can stretch out and get comfortable in every different configuration!